You practically couldn't see one of Focus Features' films in 2011 without also stumbling onto the trailer for One Day, and considering the thriving year that the studio has had -- ranging from Hanna to Jane Eyre, not to mention Bridesmaids on the Universal front -- plenty of eyes fell on its OneRepublic-powered, indie-romance tearfulness. Lots of faith was placed in the charisma that actors Jim Sturgess and Anne Hathaway generate, and it shows in the film's exposure. The faith isn't misguided; the charm Sturgess embodies in Across the Universe is both soul-crushing and chaste, while Anne Hathaway's mix of dainty appeal and untamed might creates something special in Rachel Getting Married and The Princess Diaries alike. Confidence in their talent won't falter after you've seen this middling, lop-sided tale of companionable friendship and romance that never was, but they should probably consider refraining from being love interests in other projects. 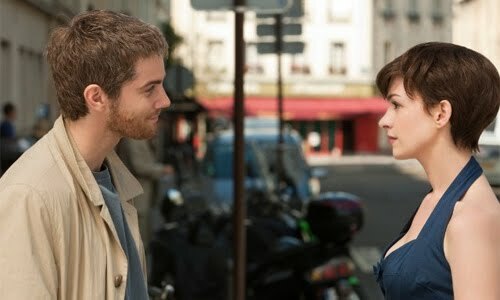 Based on the best-selling book by Dave Nicholls and draped in alternating cold blues and warm yellows in Benoît Delhomme's adept cinematography, One Day follows the not-quite romance between bright-minded writer Emma (Hathaway) and charismatic self-starter Dexter (Sturgess), spanning twenty-plus years from 1988 and onward. Starting the day they graduate from college, the story checks in with the couple every July the 15th of their "friendship" to explore how they dance around their pull to one another, finding each of them at different points in their lives: suffering jobs, mending relationships, living abroad, and coping with family illness. At first, Dex is a self-absorbed, loose-zippered TV host, wealthy and womanizing, while Emma ekes out a living while trying to find her place in the world. Eventually, the tables are turned and Emma pulls herself from her life's rut, just in time for Dex to suffer his. The suspense lies in when they'll finally drop their restraints and indulge in their palpable almost-love, if they ever can. While One Day's arrangement sounds like gimmicky romance -- dropping in on the mismatched couple on the same day every year to see how they've progressed, as individuals and as a couple -- and Dex and Emma's faux-platonic relationship is a staple among like-minded dram-coms, there's no denying that director Lone Sherfig maintains a steady, melancholy tone that avoids the saccharine or silly. She brings a similar perspective to their pushing-and-pulling as she did to An Education, where she relishes the subtlety of conversation and the occasional bustle of excitement in their travels; that includes an impromptu holiday to clear Emma's mind, reminiscent of Jenny's eye-opening trip in that film. In fact, it could be argued that Sherfig doesn't allow for enough joy, as their progression through ramshackle jobs and painstaking relationships suggests that there's simply no happiness for Dex and Emma aside from one another. That might be part of the point, but it's rendered into a glum, overcast experience here. The reason the heartrending romantic-tragedy elements don't work in One Day roots in the chemistry between Jim Sturgess and Anne Hathaway, simply because there is very, very little. On their own terms, the two maturing actors create distinct identities out of Dex and Emma; Sturgess captures brewing egotism and a strung-out '90s partier disposition well enough, as well as his cascade downward, while Anne Hathaway's catching charm and pert Brit-Scot accent transform Emma into a sarcastic, affable mate hiding underneath Dex's nose. However, there's very little romantic spark between them in their young-adult forms, and that lack of magnetism translates into an impetus for the story that doesn't maintain firm-enough footing, causing one to wonder why they'd even stick it out in the first place -- or why they'd find each other appealing. The first half of that dilemma is addressed near the story's apex, but the follow-through only convinces as far as Sturgess and Hathaway's partitioned charms will allow. Surprisingly, when we reach the later years of Dex and Emma's life, where they reflect back on the decisions they've made and what they've been missing, things start clicking together in spite of the failed chemistry between the two leads. Director Lone Sherfig pilots these deeper-rooted, weighty components -- growing up, divorce, children, and ultimately loss -- far better than she does in convincing us of the wayward friends' reluctance to finally be together, but that still proves to be a problem when One Day demands punctuation at moments that rely on the connection they've shared from the start. And when it reaches an emotional climax, one in which Sherfig elegantly frames within the film's earlier moments, it's only once again made poignant because of the investment given towards the individual characters, and less over their relationship. There's a heartrending story present here, but it's limited to an operative character study of those forlorn over what appears to be an irritating, fruitless love.